There are 4 Memory Care Facilities in the New York area, with 1 in New York and 3 nearby. The average cost of memory care in New York is $16,000 per month. This is higher than the national median of $4,650. Cheaper nearby regions include Brooklyn with an average starting cost of $4,441. To help you with your search, browse the 8 reviews below for memory care facilities in New York. On average, consumers rate memory care in New York 4.6 out of 5 stars. Better rated regions include Great Neck with an average rating of 5.0 out of 5 stars. Caring.com has helped thousands of families find high-quality senior care. To speak with one of our Family Advisors about memory care options and costs in New York, call (855) 863-8283. New York is one of the most populous states in the Union, where at least 400,000 of its nearly 20 million residents have been diagnosed with Alzheimer's disease. New York City is the most densely populated part of the state, where the U.S. Census Bureau reports a total population of 8.6 million people, 13 percent of whom are seniors over 65 years old. Many of the city's seniors who are living with Alzheimer's disease or some form of dementia are being taken care of in one of the 14 licensed memory care facilities. These facilities employ specially trained staff who supervise patients, offer stimulating activities meant to keep patients' minds active, and help coordinate doctor-prescribed care plans with families and medical staff. New York's weather can be muggy in summers, when the humidity gets up to 100 percent and the average temperature hovers near 70 degrees Fahrenheit in August. Winters are cold, with average overnight December lows of 26 degrees. These temperature extremes can cause some issues for seniors with asthma or COPD. New York gets 46 inches of rain on roughly 121 rainy days a year. The cost of living in New York City is famously pricey, and even seniors who live in memory care facilities are not immune to the housing costs that New York residents pay to live in "the city that never sleeps." Prices here are an average of 129 percent higher than the average cost of goods and services nationwide. As a comparison, the cost of living in the capital city of Albany is just 9 percent higher than the national average. New York's crime rates are unusually high by the state's standards, with violent crime rates in the Manhattan borough rising to double the state average, and property crimes sitting at roughly 30 percent higher than in the rest of the state. New York City is home to world-class medical facilities, including those specializing in brain health and dementia care such as New York-Presbyterian Hospital-Columbia and Cornell and Mount Sinai Medical Center, in the event of medical emergencies or illness. Memory Care costs in New York start around $16,000 per month on average, while the nationwide average cost of memory care is $4,799 per month. It’s important to note that memory care rates in New York and the surrounding suburbs can vary widely based on factors such as location, the level of care needed, apartment size and the types of amenities offered at each community. 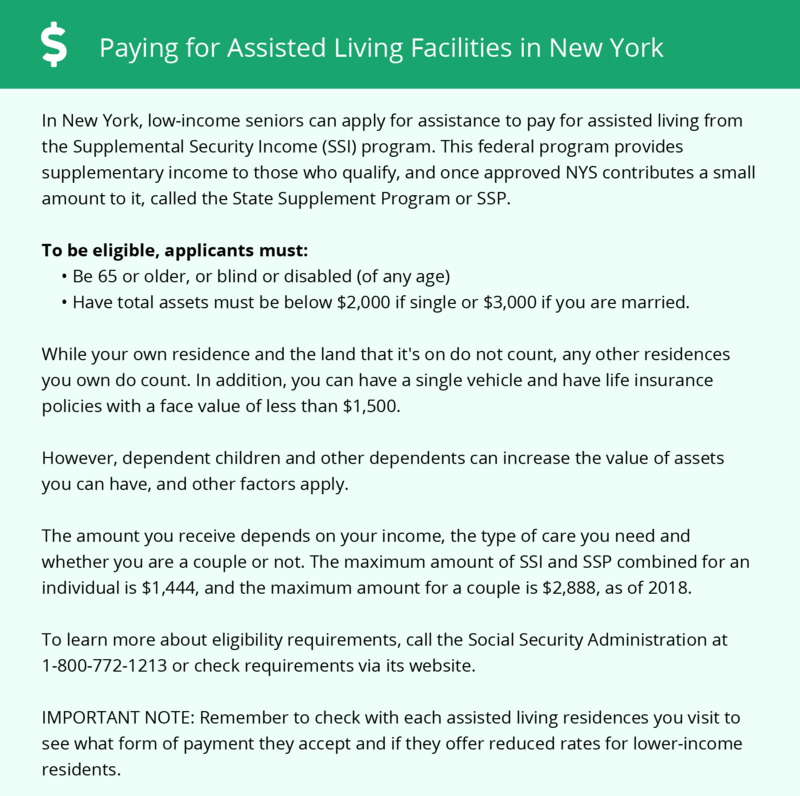 New York and the surrounding area are home to numerous government agencies and non-profit organizations offering help for seniors searching for or currently residing in an assisted living community. These organizations can also provide assistance in a number of other eldercare services such as geriatric care management, elder law advice, estate planning, finding home care and health and wellness programs. To see a list of free memory care resources in New York, please visit our Assisted Living in New York page. New York-area assisted living communities must adhere to the comprehensive set of state laws and regulations that all assisted living communities in New York are required to follow. Visit our Memory Care in New York page for more information about these laws.